The Valois Mistress is my first full length novel, and I’m very excited to share it with you. The book’s still in the editing stage, but I’m hoping to get it out this December. If you want to get an advanced copy, click here. While you’re waiting, get to know the people of the French Court before the book comes out. If you aren’t familiar with Charlotte’s story, Wikipedia has you covered. SPOILER ALERT: since the book is biographical fiction, some of the plot twists are in the article. 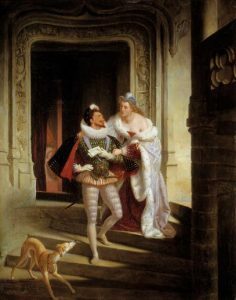 The Marquise of Noirmoutier, Charlotte de Beaune Semblancay (1551-1617) seeking to dissuade Henry I of Lorraine, Duke of Guise, called the Scarred (1550-1588), to go to the meeting of the States of Blois before his assassination (1588) at the Chateau de Blois. Painting by Charles Barthelemy Jean Durupt (1804-1838), 1833. Oil on canvas. Communal Museum of the Castle, Blois, France. 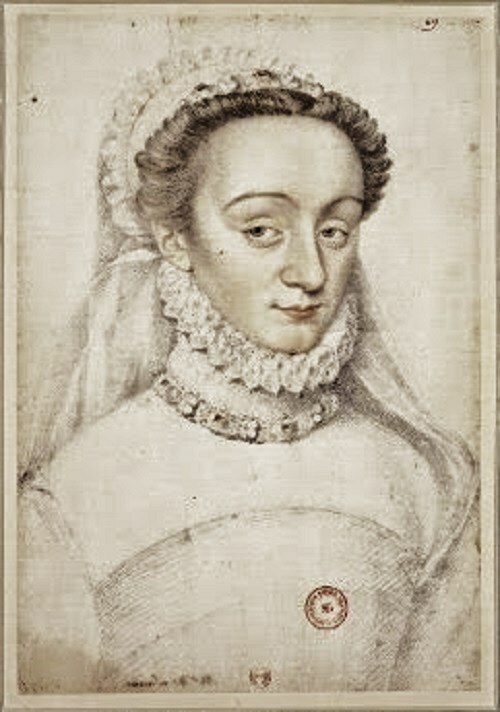 Charlotte de Beaune de Semblancy was never at a loss for lovers, whether she did so at the behest of the royal family or to save her own legacy. Take a look at the men who shared her bed during her career as a courtesan. She had one King, one prince, two dukes and a marquis for bed mates, which in any country other than France would be considered a record. The Beaune family originally came from the Burgundy region of France, and by the time that Anne of Brittany was first crowned queen consort of France, were at the top of society in the city of Tours. Parts of Charlotte’s home are still standing, having survived the French Revolution and bombing during World War II. There are only a few Beaune family members immortalized in portraits, but Charlotte’s aunt Claude was one of the major patrons of Francois Clouet, portrait painter of the French court. Stay tuned for more updates on The Valois Mistress. It’s the first of three novels about Henry IV of France and his mistresses. Book two, The Uncrowned Queen, will focus on Gabrielle d’Estrees, the woman considered by historians to be the love of Henry’s life. Book three, The Queen’s Nemesis, will look at the rivalry between Henry’s second wife, Marie de Medici and Catherine Henriette de Balzac d’Entragues, Henry’s most avaricious mistress. Get advanced copies of upcoming books and learn about sales and other goodies by signing up here or via the form below.